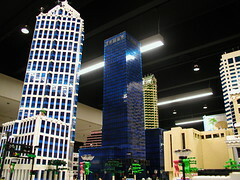 Come to this model train show and see the Greater Florida LEGO® Train Club's rendition of the Downtown Tampa's skyline in LEGO® bricks! This is one of our larger layouts this year with many LEGO® trains running throughout our ever growing layout. For more on the Downtown Tampa models see the Tampa Project Page.